There are several options to manage your Budapest airport transfers: you can use the official Fotaxi cab company, or more affordable taxi companies, the airport shuttle minibus, or even the really cheap public transport. See some of the most popular ways and tips about how to get from Budapest Airport to the city centre of Budapest and back to Budapest Airport again. The official Budapest Airport taxi company is FOTAXI (Főtaxi, say fur-to-xy). See the official website of Fotaxi here and more about Budapest Taxis here. As you come out of the terminal (no matter which of the terminals) at the Budapest Airport, you will literally be by the Fotaxi taxi stall, there is no way you can miss it. Fotaxi cabs go very, very regularly and as late as flights arrive (even late night or in the wee hours), so if you cannot, or do not want to pre-arrange a taxi for yourself for the Budapest airport transfer you don’t need to worry, Fotaxi cars will be there and take you to the city of Budapest. Here are the taxi fares applied by Budapest Fotaxi for their airport transfers (see picture). What is the cheapest airport transfer to Budapest? Obviously, taking taxis in Budapest is not the most affordable, although reasonable way to make your airport transfer smooth and efficient (see some of the trusted Budapest taxi companies here). The cheapest airport transfer regarding ‘Budapest Airport Terminal to Budapest City Centre’ is the public transit. Very efficient, very fast, and easy to use – but we do not suggest taking the bus and metro with lots of luggage (e.g. a traditional big suitcase, or basically anything more than an onboard handbag, or carry-on rucksack). It is a hassle, believe us (taking the stairs, pushing through the baggage, etc.). So if you don’t have a lot of luggage or bulky bags, it is a great money saving option to take the public transport to the city centre of Budapest. You can catch the new 100E bus, which runs every day on the following route: Deak Ferenc Square- Astoria- Kalvin Square- Liszt Ferenc Airport. Tickets can be purchased for HUF 900 (in the automats, ticket offices and directly from the drivers). The timetable of the 100 E bus is the same every day (even on Sundays or on bank holidays). The bus comes in every 20 minutes from 3:40 to 0.40 am. The Astoria stop is available only for getting on at 3.40 am, 4 am, 4.20 am and 4.40 am, the bus is not stopping during the day. The Kalvin square stop is also only available for getting on throughout the day. The first bus leaves at 5 am from the front of the Terminal 2 and the last bus leaves at 1.20 am to the city. Every bus stops at the Kalvin Square and at the Astoria too for drop off (Metro stations). The 100 E bus is stopping only in a few bus stations and it starts in the city centre. The ride takes appr. 40-60 minutes, but the actual time is highly influenced by the traffic. Therefore, we recommend to count at least 1.5 hours for the bus ride to make sure, you do not miss your flight. The bus 200 E is also an option for HUF 450. It has more stops and it can be boarded at ‘Kobanya – Kispest (KOKI) station. Please note, that this bus can be crowded. If you are coming from the Airport, take bus 200 E to the end, the final stop is called ‘Kobanya – Kispest metro station’, then change to M3 blue metro line to the heart of the city (the first 200 E bus leaves at 4:06 am every day, while the last bus leaves at 00.21 am every day, and they are coming every 10 min. The early buses and the night buses are coming in every 15-30 min. Before getting on the metro, don’t forget to validate your tickets in the punch machines (not on the metro cars, there is none on them). This cheap public transport Budapest airport transfer will cost HUF 490 (compared to HUF 7500-8500 for the Fotaxi transfer, the official airport taxi company). You can buy the transfer ticket at the newsagent at the Budapest Airport. Please specify to the newsagent vendor that you wish to have a so-called ‘transfer ticket’ not simply ‘ticket’ as the transfer ticket includes the price of the 200 E bus ride (please validate the ticket on the bus) and the price of the ride on the M3 metro (please validate the ticket again before entering the metro area – the punch machines are not on the metro vehicles, and ticket inspectors are mercilessly unfriendly, as you must have read on other Budapest travel forums). Alternatively, you can buy a simple bus ticket from the bus driver for HUF 450, and then buy your Budapest travel pass at the metro station (passes are available for 1 day, 3 days, 7 days, etc. ), which will be instantly valid for your metro trip too. If you are wondering if it is worth buying the combined ‘Budapest Card’ (public transport pass plus some discounts on various museums, etc. ), the consensus is that most tourists and locals find it, well, a not so good deal. 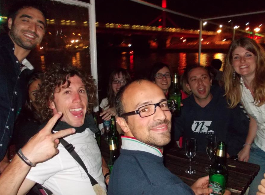 The reason is that the discounts cannot be used really well and economically in such a short frame of time as a typical Budapest holiday lasts. Nevertheless, the airport vendor will sell Budapest Card (and usually not the standard travel pass) for the commission. Up to you. 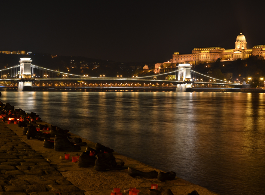 Another option is to take the train from the Budapest Airport Terminal 2, and go to Nyugati Train Station. Obviously, it is less flexible than the bus and metro ride to the city centre of Budapest, but it is very efficient and there is no change during your trip. The train trip between the airport and Nyugati Railway Station is approx. 25 minutes, and you will immediately see one of the less hyped Budapest attractions, the Nyugati Train Station designed by the Eiffel Engineering Company. Beautiful. You can buy the train ticket right at the Budapest Airport at the Airport’s Tourinform Tourist Office at Terminal 2, which is open every day from 8am to 10pm. In theory, you can also buy your airport transfer train ticket at platform B at the railway station by the airport from a ticket vending machine, but in practice, this vending machine is oftentimes vandalised, sorry. Now, using the train from the airport terminal to Nyugati Railway Station is very simple, as you get off at the final train stop. However, if you want to go from Nyugati station to Terminal 2, you must be alert as the train is not a mere ‘Budapest Airport Transfer Train‘, so it will run on and on if you don’t get off at the right stop to catch your flight. In other words, there are lots of trains calling at Budapest Airport train station, which go to various little and big towns in the countryside of Hungary (Szeged, Monor, Nyiregyhaza, Cegled, etc.) and not just to the airport. Accordingly, there is no permanent platform at Nyugati Train Station where airport transfer trains would leave from (most leave from any of the following e.g. 10, 12, 14, 17). Even though the trains in Hungary are run by MAV, while buses, metros, trams, trolleys and suburban HEV trains are run by BKV (Budapest Public Transit company, BKV for short in Hungarian), two different companies, you don’t need to buy a separate train ticket to the Airport – meaning Nyugati Train Station to Budapest Airport – presuming you have a valid BKV public transportation travel pass. If you don’t have a Budapest public transport travel pass, you will have to buy your train ticket at the railway station to get to the airport without being fined. The cost of the train ticket is approx. HUF 520 for the trip to the Budapest Airport (2nd class). 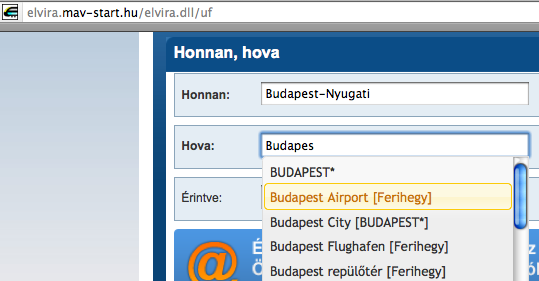 When you want to check the current train timetables, the MAV train company system does not recognize the new name of the airport (Liszt Ferenc Budapest International Airport), but the old name is fine (Ferihegy), or you can simply start typing ‘Budapest’ in the destination box, see in the picture, and you will suddenly see the airport options (in English, in German and in Hungarian too). Pick Budapest Airport, then proceed to see the current train timetables. Furthermore, there is also an option, although not as cheap as the public transport, to use the Airport Shuttle minibus, which is a shared ride service. Unless you are in a hurry or travel with others. The airport shuttle bus is ideal for solo travellers, who don’t mind to take a half an hour detour to get to their Budapest hotel. It is also an environmentally responsible choice. There is a booth for the official Budapest Airport shuttle, and it is hard to miss. Another cheap option might be Budapest Airport Transfer Plus. The company seems to be well sought after to get to the city centre of Budapest cheaply. Please check their website for prices and fares. In addition to the fixed cheap price offered by, Budapest Airport Transfer Plus also advertises 24 hour confirmation guarantee, no extra charges for waiting time if the flight should be delayed, etc. They also cater for even bigger groups (8+), and make transfers to the countryside or Budapest festival venues, like direct airport transfers to Sziget Festival on Obuda Hajogyari Island, direct airport transfers to Formula 1 Hungaroring or to Lake Balaton, direct airport transfers to Ozora Festival, and so on. To boot it all, they do transfers from Budapest to Vienna, Zagreb, Prague, Belgrade and Bratislava too. Please write your comments, questions, reviews of Budapest airport transfers in the comment section to help us keep the airport transfer info updated and traveller friendly. TopBudapest.org does not give quotes, does not make bookings, fare calculations, etc. Please contact the companies directly, we do not embrace them, neither are we in business relations with them.